As with humans, dogs react well to positive reinforcement. Such reinforcement should play a critical role in the training process for your pup, but many people handle this incorrectly because of a small slip up – they provide reinforcement at the wrong time. You will read over and over that you must be dominant to your pet if you wish it to behave in certain ways. This is true to some extent, but being a power monger isn't the greatest way to proceed with a pet relationship in my opinion. Do you need to be dominant at times? A dog breeder will tell you the answer is yes. Do you need to use this approach all the time? No. Positive reinforcement is often the better approach. 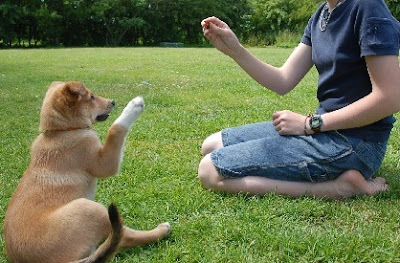 Positive reinforcement is critical to establishing certain behaviors with your dog. Reinforcement can be in the form of a treat, pet or sound that signifies the dog has performed properly. Having said this, it is vital the reinforcement be supplied at the correct time during the dog's behavior. Let's assume I own a lab named Maggie and I am trying to train her. If I call her to me from one side of the yard, tell her to sit and then feed her a treat when she complies, what behavior am I positively reinforcing? I am not telling Maggie she is a good dog for coming to me. Instead, she will most likely associate her treat with the act of sitting. This is fine if I am trying to teach her to sit. If I am trying to teach her to come to me when called, however, this is not ideal. So, how should I have handled this situation correctly? Once I called her to me and she complied, I should have given her positive reinforcement in the form of a treat. I should have then told her to sit. When she did, I should have given her a second indication of positive reinforcement. Instead of just associating sitting as the proper behavior, Maggie will associate both coming and sitting as proper behaviors. Let's consider another situation. Working with a professional dog trainer? One way to determine if you are with a good instructor is to listen carefully to what they tell you during training. If you are tasked with giving the dog a command and the dog complies, the next step should be what? If the trainer starts instructing you and drawing your attention to anything other than giving the dog a treat, you have a problem. If the trainer reminds you to immediately reward the dog before giving additional instructions, you are with the right trainer. There is a secondary problem with delaying positive reinforcement. Not only does your dog not associate the treat with a specific action, the treat loses its value as a reward for action. Why? Well, the dog is being rewarded for doing nothing if you delay. Is petting a form of positive reinforcement? Yes and no. The correct answer depends on your dog. Each pup has different views on being petted and you should be able to figure them out pretty quickly. Some dogs prefer not to be petted on their head. Others prefer not to be petted along their back. Nearly every dog I've ever met prefers to be petted on their rump just above the tail! The important thing is to learn where they prefer to be petted and then pet them in that location when giving positive reinforcement. Ultimately, positive reinforcement is a great training method for your pup, one you both will enjoy. Just make sure you are timing the reinforcement quickly so your dog associates it with the behavior in question. Annie Klacks has had dogs her entire life and loves them dearly. As an adult, she works with Animaroo.com. You can visit the site here to learn more about different breeds.